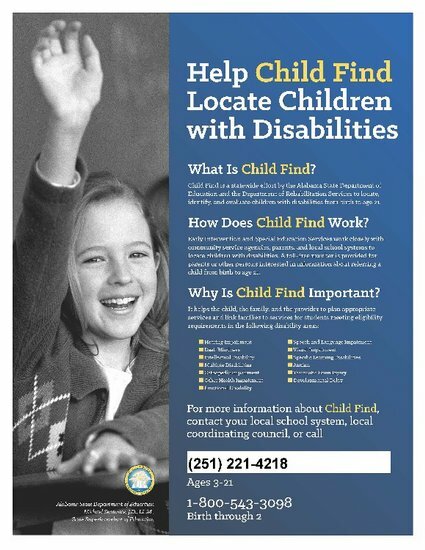 The Division of Special Services strives to work closely with parents and caregivers of students with disabilities. For additional information, please contact the Division of Special Services at 251-221-4218. Facilitated IEP Team Meeting: Parents and/or school systems may request the Alabama State Department of Education (ALSDE) to provide facilitation services to assist the IEP team in making determinations regarding identification, evaluation, educational program, placement or the provision of a free appropriate public education for students with disabilities. The Facilitated IEP Team meeting will be conducted by a qualified and impartial facilitator at no cost to the parent or the school. Please contact your Special Education Resource Teacher or the Division of Special Services to receive a Request Form and/ or for additional information.